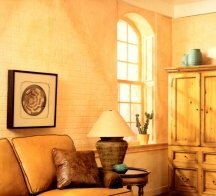 Shades of orange can add warmth, life and energy to your home. What happens when you combine the energy of red with the optimism of yellow? Of course, your get orange - the world's friendliest hue! So consider using it in a joyful corner instead of yellow, or in a high-vibe buoyant space instead of red. 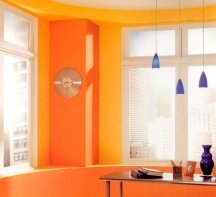 Best suited for rooms with Northern exposure, orange paint colors can compensate for the lack of sunlight and chase away the gloominess of dark spaces. And with so many shades of orange - ranging from subtle peach to funky tangerine, you are bound to have a favorite! Got attitude? Why not make a statement with intense orange colors like tangerine, carrot, persimmon or pumpkin? 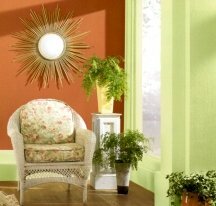 Used together with turquoise, lime green and hot pink, these fiery shades can add a lot of punch to an ordinary room. Bright orange colors like these make an extremely good accent color, and they are most powerful when used sparingly: to infuse your room with fun and passion, all you need is a few hot orange color accessories in your decor. A striking orange is usually too hot and stimulating to be used for painting an entire room, so to satisfy your craving for this intense color, it's best to settle for just one orange accent wall, and then spread some accessories in the same color around the room. Definitely not for the faint of heart, bold shades of orange look best in contemporary and minimalist decors. But to make an orange color scheme really work, you also need lots of white and other neutrals there to tame the "flame". Let the pure color "speak", and keep the rest of your decor "quiet", remaining in the background. And avoid using black together with bright orange colors - or you could end up with a Halloween-looking room! 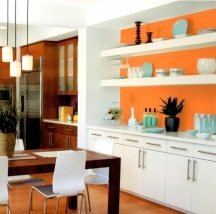 If you are not used to bold colors in your decor, you can still use orange. 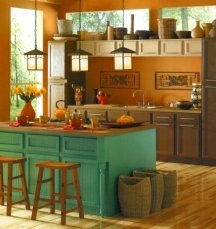 Subtler shades of orange like peach, apricot or salmon are a safer choice if you are just getting started experimenting with color in your home. These classic orange colors are appropriate for any home decorating style. In fact, you can often see these shades in many traditional floral fabric patterns. Unlike the brighter hues, soft orange tones are less trendy and stimulating. You can bathe an entire room with them, and still keep the atmosphere peaceful and serene. Different shades of green and blue will add coolness, and balance out a soft orange-based color scheme. And because peach and salmon hues complement most skin tones, they are a good choice for painting bathrooms and other areas where you apply makeup. These are the most timeless shades of orange that have been around for ages! Originally derived from natural pigments, these muted tones look almost neutral - and just like in nature, they beautifully coordinate with most other, nature-inspired colors. 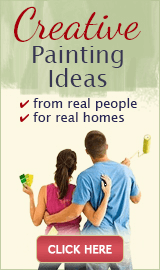 And even though you can most often find them in Tuscan, Mexican, Santa Fe and Mediterranean decors, toned down and muted orange wall colors are appropriate and acceptable in most home decorating color schemes. Treat them as neutrals, because they serve as a natural backdrop that allows other hues to unfold. an earthy orange will look good with other muted shades like brown, as well as with brighter shades of yellow and green. 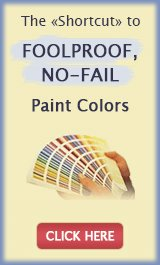 And to find the right orange paint color fast, check out the Paint Color Cheat Sheets for the best 7 shades. Here's how other people have used orange paint in their homes - take a look at these photos and stories submitted by our readers, and don't forget to leave a comment. And if you have your own orange room painting project to share, click here and see your name in lights! Our Living Room Walls Painted a Subtle Orange Color "Glazed Donut "